Abhishek was born in 1990 at Bihar. 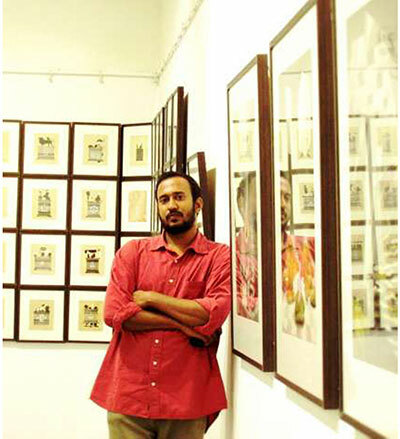 After graduating in painting from the College of Art, New Delhi in 2012, he joined at the Faculty of Fine Arts, MS University, Baroda where he took his post-graduation in print making in 2015. Abhishek was a Gold medallist at MS University and also received a Scholarship from Ministry of Culture in 2014. The imagery in his paintings, drawings and prints have continuously stemmed from his own history which is derivative of his physical and mental status in the constantly changing and demanding society. His works revolve around ideas of dysfunctionality, the strange logics of irrational behaviour arising out of one’s anxiety, which he injects in his characters. The familial, social and political collide in dramatic settings where the lighting also becomes hallucinatory. There is satirization of situations, of characters, of himself. The insecurities of one’s existence morph into an ironical, laughable identity”. Becoming sensitive to and aware of the world as a child makes one go searching for heroes or ideals. These can be those who live in the myths, epics, and the folklores told by one’s grandmother. As great and dramatically they narrate, they want to imbue lessons, morals, etiquettes, cultures. Some of these moralistic stories tend to always describe the miserable conditions of the characters. Because of some act, either brought upon themselves or by others around them, they would end up in a dilemma, or even as drastic as being thrown on the roadside, as they witness their life fall to pieces. Although these stories are assembled with an optimistic vision and ultimately there is always a happily ever after to show others a path with the “right action”, all the “heroes” had to struggle, make mistakes, feel totally lost. All their earlier visions crumbled into confusion and anxiety because of the drastically changing environment. So what if you told these ideals, these heroes to come down from that final pedestal? Would they become like us, would they stay beside us? What if we kept them in that in-between, that horrible interstice where you have no way in and no way out? They become an absurd image, a fiction so mutilated, there is no longer any sense. These are reflective of the acts of decisions made due to the various situations in our day to day conflicts between personal, social and political milieu. All these different events have a common ground: the pedestal, the milestone of achievement. But without that actualisation, all of these images then become almost like a joint family with a sense of violation. These are the other ideals, the other heroes.